"It is remarkable that such massive dense objects were able to form so soon after the Big Bang," said Michael Strauss, a professor of astrophysical sciences at Princeton University who is one of the co-authors of the study. "Understanding how black holes can form in the early universe, and just how common they are, is a challenge for our cosmological models." This finding increases the number of black holes known at that epoch considerably, and reveals, for the first time, how common they are early in the universe's history. In addition, it provides new insight into the effect of black holes on the physical state of gas in the early universe in its first billion years. The research appears in a series of five papers published in The Astrophysical Journal and the Publications of the Astronomical Observatory of Japan. Supermassive black holes, found at the centers of galaxies, can be millions or even billions of times more massive than the sun. While they are prevalent today, it is unclear when they first formed, and how many existed in the distant early universe. A supermassive black hole becomes visible when gas accretes onto it, causing it to shine as a "quasar." Previous studies have been sensitive only to the very rare, most luminous quasars, and thus the most massive black holes. The new discoveries probe the population of fainter quasars, powered by black holes with masses comparable to most black holes seen in the present-day universe. The research team used data taken with a cutting-edge instrument, "Hyper Suprime-Cam" (HSC), mounted on the Subaru Telescope of the National Astronomical Observatory of Japan, which is located on the summit of Maunakea in Hawaii. HSC has a gigantic field-of-view -- 1.77 degrees across, or seven times the area of the full moon -- mounted on one of the largest telescopes in the world. The HSC team is surveying the sky over the course of 300 nights of telescope time, spread over five years. The team selected distant quasar candidates from the sensitive HSC survey data. They then carried out an intensive observational campaign to obtain spectra of those candidates, using three telescopes: the Subaru Telescope; the Gran Telescopio Canarias on the island of La Palma in the Canaries, Spain; and the Gemini South Telescope in Chile. The survey has revealed 83 previously unknown very distant quasars. Together with 17 quasars already known in the survey region, the researchers found that there is roughly one supermassive black hole per cubic giga-light-year -- in other words, if you chunked the universe into imaginary cubes that are a billion light-years on a side, each would hold one supermassive black hole. The sample of quasars in this study are about 13 billion light-years away from the Earth; in other words, we are seeing them as they existed 13 billion years ago. As the Big Bang took place 13.8 billion years ago, we are effectively looking back in time, seeing these quasars and supermassive black holes as they appeared only about 800 million years after the creation of the (known) universe. 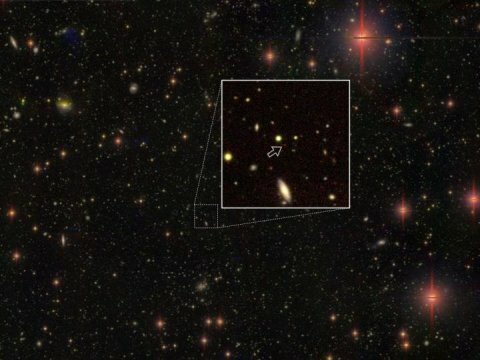 It is widely accepted that the hydrogen in the universe was once neutral, but was "reionized" -- split into its component protons and electrons -- around the time when the first generation of stars, galaxies and supermassive black holes were born, in the first few hundred million years after the Big Bang. This is a milestone of cosmic history, but astronomers still don't know what provided the incredible amount of energy required to cause the reionization. A compelling hypothesis suggests that there were many more quasars in the early universe than detected previously, and it is their integrated radiation that reionized the universe. "However, the number of quasars we observed shows that this is not the case," explained Robert Lupton, a 1985 Princeton Ph.D. alumnus who is a senior research scientist in astrophysical sciences. "The number of quasars seen is significantly less than needed to explain the reionization." Reionization was therefore caused by another energy source, most likely numerous galaxies that started to form in the young universe. The present study was made possible by the world-leading survey ability of Subaru and HSC. "The quasars we discovered will be an interesting subject for further follow-up observations with current and future facilities," said Yoshiki Matsuoka, a former Princeton postdoctoral researcher now at Ehime University in Japan, who led the study. "We will also learn about the formation and early evolution of supermassive black holes, by comparing the measured number density and luminosity distribution with predictions from theoretical models." Based on the results achieved so far, the team is looking forward to finding yet more distant black holes and discovering when the first supermassive black hole appeared in the universe.